Finger puppets never stopped being fun and making up songs for them is even more fun! If you have a younger brother or sister, try making a set for them and surprise them with a gift! All you need is some felt, wiggle eyes and needle and thread. Use the patterns and cut out your pieces. 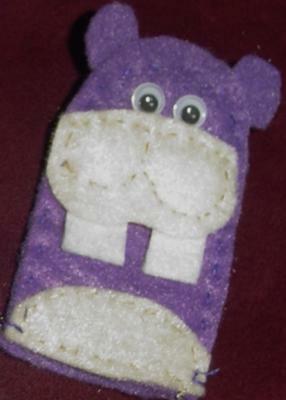 Take one body piece and sew on any parts to this, such as in the hippo. Sew on the cheeks piece and be sure to tuck the teeth under it as you sew. Then sew on his little tummy piece. Put both body pieces together and sew around the edges. Make sure you leave the bottom open to get fingers into! Glue on some little wiggle eyes. You can write down these songs to go with the finger puppets or try making up one of your own. Do the same with the mice. Sew on their inner ears first to one body part. You can glue on a tiny circle of pink felt for noses or glue on a tiny pom pom. Sew your two body pieces together, leaving the bottoms open on each. Draw on whiskers and bow ties with markers. NOTE: If you are going to make a set as a gift, here's an idea of how to package them. Use thin cardboard or poster board and lay your hand on it. Spread your fingers out and trace around your hand. Cut your hand out and slide one puppet onto each finger. For the pouch to put them in, you will need 4 sheets of felt. These cost 20 cents each at WalMart. For the mice, you will need 2 yellow and 2 black. Cut small holes out in several places on each yellow felt sheet so it looks like swiss cheese. Put each yellow one on top of a black one and sew all around the edges. Now put your two together and sew around 3 sides. 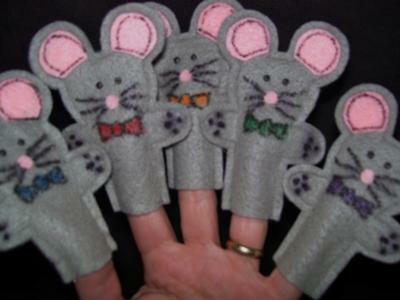 Put the cardboard hand with the puppets on the fingers inside your cheese pouch! For the hippos, you will need 2 light blue felt sheets and 2 dark blue ones. Cut the light blue ones so they look like waves of water. Put each on top of a dark blue and sew together as stated for the swiss cheese. The 1st one said, "I hope we find cheese!" The 2nd one said, "Come help me please!" The 3rd one said, "What's wrong with you?" The 4th one said, "Whatever should we do?" The 5th one said, "Here comes the cat!" And 5 tiny mice ran away real fast! 1 big hippo said, "This is no fun!" So off he went and then there was none! Thank you for sharing the idea. My kid did love the idea and he was listening to the song with much interest. I think the finger puppets are the ones that attracted him the most. And it is easy to make too.